Donations For Life	The Freelance Hunters Launch Party! With summer movie season already begun and a host of superhero comic book adaptations leading the pack, it is time for Hugh Likes Comics to embrace the trend and give you some hop on points for Big-2 Superheroes. These characters have long, tangled pasts, and their stories are far too often are an impenetrable soup of references, call backs, and retcons. So for the summer, I’ll be discussing some of my favorite, and most accessible stories from Marvel and DC Comics. Since we just got a lovely image of Ben Afleck moping next to his rocket car for “Batman vs. Superman,” let’s start with the Dark Knight. In a Gotham City ruled by Organized Crime, a young Batman teams up with Commissioner Gordon and D. A. Harvey Dent. But they aren’t the only trying to bring down the mafia. Criminally insane Freaks like the Joker and Poison Ivy are muscling in, and a serial killer dubbed “Holiday” has begun killing gangsters, each on a major holiday. Can Batman truly complete the task he’s given himself, or is Gotham city doomed to be cut in half by Organized Crime and random violence? First of all, let me start this review with a confession: I like this graphic novel better than it’s predecessor, Frank Miller and David Mazzucchelli’s groundbreaking “Batman: Year One.” “Year One” is a GREAT story, and a wonderfully gritty depiction of the kind of city that made Batman not only possible, but necessary. 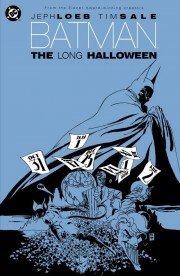 But “The Long Halloween” is a noir mystery filled references to “The Godfather” that ends with Batman fighting his entire rogues gallery at once, so it wins out. Year One is an engaging look at how Jim Gordon and Bruce Wayne came to be who they are. The Long Halloween boils that origin down to a single sentence: “I made a promise to my parents that I would rid the city of the evil that took their lives.” It doesn’t get simpler than that. And as reductive as the set-up is, the book is actually a nice character driven piece about the human cost of working towards goals. Relationships get shredded by the weight of these personal quests. Jim Gordon’s relationship with his family. Harvey Dent and his wife Gilda. Even The Roman’s relationship with his children is deeply affected by his work. And then there’s Batman and Catwoman. Their relationship is extremely complicated, both in costume, and out of costume. It lends the noir elements significant weight. But one thing that this comic does, and does really well, is temper that weight with super-heroic sections. The focus of the book is the Holiday mystery, but Batman still has to contend with The Joker, Poison Ivy, Solomon Grundy, and the rest of his villains. In a lesser run of comics, the change would be abrupt, and flow breaking. “I can’t look for clues today, The Joker is robbing that bank!” But here, everything flows naturally. The colorful characters are all weaved like brocade into the black fabric of the noir mystery. For example, at one point, Batman chases a fleeing buttonman into the sewers, where he accidental fumbles into the lair of Solomon Grundy. Later, the Falcone family brings in the riddler as a consultant, green suit and all, to help solve the murders. Instead of being asides, these sections lend a depth to Gotham City, and raising the stakes. It evokes the best parts of my introduction to the characters, Batman: The Animated Series. Sale’s art, and Gregory Wright’s colors, bring the story to life. There’s a rich, velvety darkness to Sale’s Gotham City. The page layouts are also really well done. The book is filled with gorgeous splash pages, and Sale really knows how to guide the eye and build tension. A great deal of imagery from this book was included in Christopher Nolan’s “Dark Knight” film. “Batman: The Long Halloween” is the perfect graphic novel for readers who want to see the World’s Greatest Detective tackle an engaging mystery and fight crazy villains without wading through 75 years of canon. It can be found at your Local Comics Shop, or purchased digitally through Comixolgy! Next week: The Astonishing X-Men!